Tip: When re-routing new lines, closely measure all of your lengths beforehand to avoid last minute miscalculations. When it comes to cars and our beloved spontaneous combustion engines, fuel (and plenty of it) is the name of the game. Regardless of size or design, all engines rely solely on fuel being pumped in from an outside source, such as the tank. And to this we look no further than the workhorse we know as the fuel pump. Fuel pumps come in a variety of forms and can be mounted in several different locations. Today, most late-model vehicles utilize an electric pump, which is typically installed inside the tank. 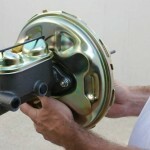 However, the older, and by far the most common design, would be the mechanical fuel pump. Simply mounted on the side of the engine block, these pumps use the age-old method of a single pushrod to get things flowing. The fuel pump pushrod is driven by the camshaft to actuate the pump’s rocker arm– much like the valvetrain in the cylinder heads. Plunging away, the rod literally sits on the top of the rocker arm, unloaded. The actual supplying of the fuel to the pump is again very straightforward. Basically, you have a main line, either 5/16” or 3/8”, running front to back (the length of the car) between the fuel tank and the pump. This is your suction line. The spring-loaded rocker arm is actuated up and down by the rotation of the cam, creating a negative pressure or vacuum in the system, and drawing fuel in from the tank. On the outlet side of the pump is the pressure line, which then feeds the fuel into the carburetor’s bowl(s). At some point between the tank and the inlet of the pump, it is highly recommended to install a quality fuel filter. This will keep the gunk and debris in the tank from entering your fuel pump, and more importantly, your engine. Although it’s not uncommon to see a 35 year-old car still running and retaining its factory fuel pump, these components will eventually wear down and fail. Therefore, a little preventative ”R&R” would probably be a good idea. Besides, even at their best, the factory units of yesteryear pale in comparison to the high performance standards of today. So what are we waiting for? 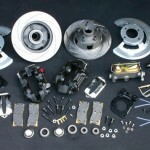 Starting with the disassembly, first remove your lines from the inlet and outlet of the fuel pump. Place a container underneath the pump to recover any spilled fuel, then plug or clamp off the lines if needed. The pump, held on by 2 bolts, should now be free and ready for removal. Just to be on the safe side, I always recommend using new pipefittings on projects such as this one. If your new pump did not include them, they can be found at any hardware store. Keep in mind you will need fittings for the regulator as well. Install the proper fittings on the pump and regulator prior to installation. This gives you a little more room to ensure everything is tight and ready to go. When reinstalling the pump, use a small screwdriver to carefully hold the pushrod up and out of the way. After cleaning the mounting surface of old gasket material, apply a small dab of sealer to the new gasket and reinstall the fuel pump. Getting the pump into place and making sure the pushrod is properly seated on the rocker can be a little tricky at times. The pushrod has a natural tendency to slide down inside the block, past the point of actuation. If clearance allows, use a small screwdriver to retain the rod while backing the pump in (see photo 1). 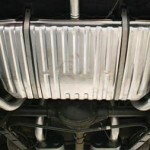 Another alternative is to pull the pushrod all the way out, “pack” it with some heavy engine grease, and lodge it back in. However, this will only work with a cold motor. 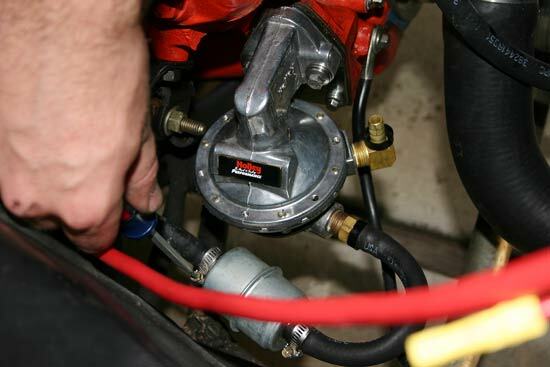 With that accomplished, you can now reattach your fuel lines as necessary and secure them in place with hose clamps. If you choose to run AN lines (recommended), clamps are not needed. Here we are installing our fuel filter. The line is cut and attached to both sides of the filter, then held in place with adjustable “worm gear” clamps. The addition of a fuel pressure regulator in the system is a simple one to understand and to install. With any temperamental, high performance motor, the more flexibility in tuning you have, the easier it is to consistently control. And the regulator does just that. 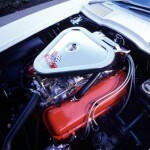 It guarantees a consistent pressure of fuel to be present and delivered to the carburetor without fail. That’s just one less variable for you to worry about. With everything back in place, the only thing left to do is securely mount the regulator to its bracket and attach it to any rigid surface. In this case, we will most likely use the inner fenderwell. To install, merely route the pump outlet line to the regulator inlet port. 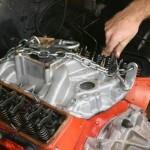 The line coming out of the regulator will then serve as the carburetor inlet feed (see photo 3). 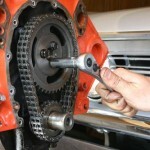 Adjusting the regulator is as simple as turning a wrench, literally. And the small, but clear pressure gauge lets you dial it in just where you need it for maximum performance.